Welcome to Indiana Creations, Manufacturer and Supplier of Ladies Apparels and Home Furnishing Products. The company was established in 2011 at Jaipur. Efficient logistics support and reliable vendor base help us to achieve a present repute in the market. International quality standards, market leading prices and variegated payment options are the factors that help us to stay ahead of our competitors. 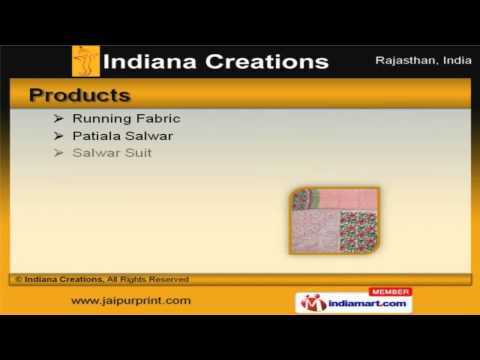 We offer a wide variety of Running Fabric, Patiala Salwar and Cotton Dupatta Suits. Designer Kurti, Cotton Printed and Mangalgiri Kurta offered by us are best in the industry amongst others. We also provide Men Kurta, Silk Sarees and Chanderi Dupataa at cost effective prices. Designer Chanderi Dupatta, Women Lahanga and Cotton Printed Fabrics are reckoned all over the world for their superb quality. Our Printed Tunic, Handmade Paper and Kids Wear are setting a benchmark in the market. Our organization is highly involved in providing an impeccable range of Home Furnishing Products, Printed Curtain and Printed Silk Sarees for Parties.